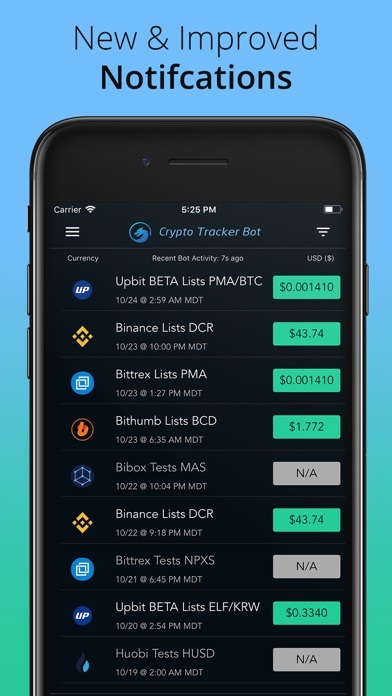 Crypto Tracker Bot and Portfolio Tracker is the only iOS app that offers users real-time push notifications when new currencies get listed on the most influential exchanges in the world. Our service puts users ahead of the curve by delivering detailed price and market information before the general public gets word. 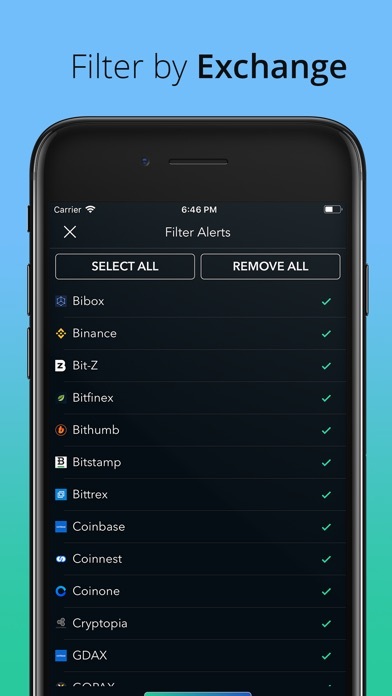 Stop checking other crypto apps like Blockfolio or Delta and let Crypto Tracker Bot app notify you with immediate crypto updates. How does it work? PORTFOLIO & PRICE TRACKER Instantaneous summary of your crypto portfolio with easy to insert price alerts. Stay aware of your current market gains and losses and be able to better evaluate where you stand in this quick changing market. Be able to select portfolio evaluations in USD and BTC. 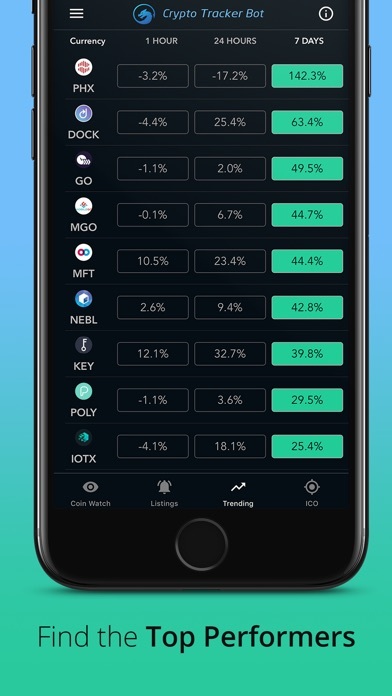 Each crypto token in the app has the most recent market data and provides detailed line plots, volume trends and listed exchanges. App supports over 3,000 cryptocurrencies. 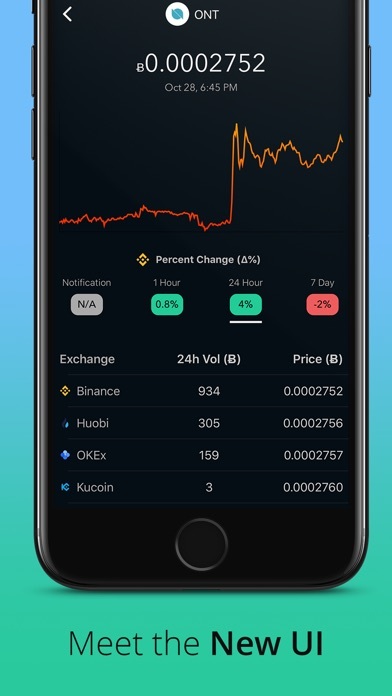 PUSH NOTIFICATIONS Our proprietary algorithm searches for news, rumors, and info related to new currencies getting listed on the most influential exchanges. 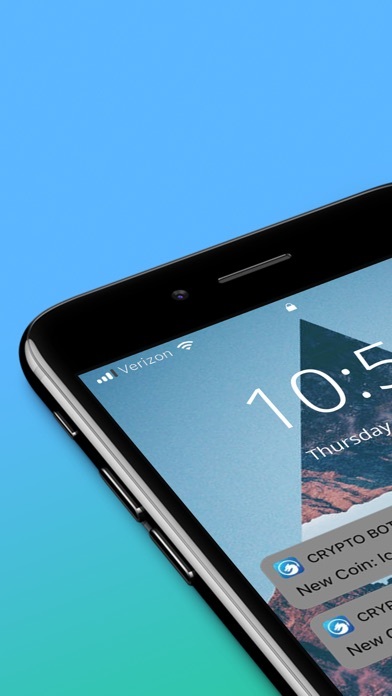 We send users push notifications when a new currency is listed, or has the potential to be listed in the near future. 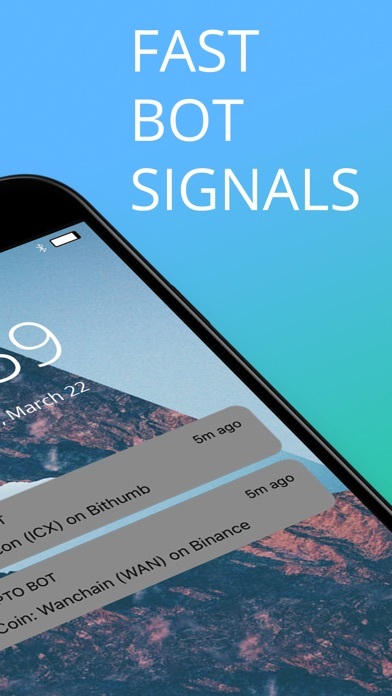 Users can highly customize their push notifications received from Crypto Tracker Bot. EXCHANGE FILTER With this new feature, users can customize which exchanges trigger the real time notifications. COIN WATCH If users are only interested in receiving notifications from a specific currency, Coin Watch allows users to filter out the noise and receive push notifications for their favorite coins. 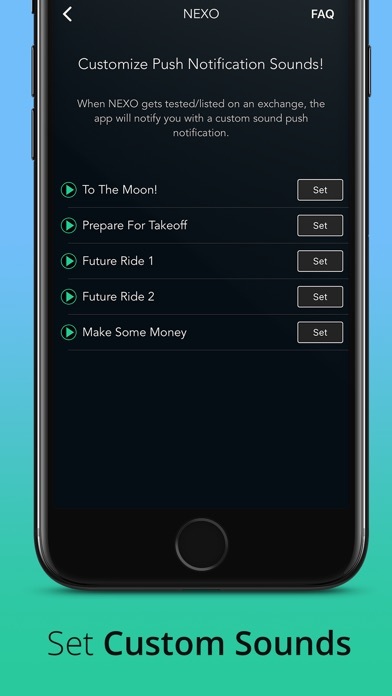 Users can also set custom push notification sounds for each coin. Supported exchanges include: - Bibox - Binance - Bitfinex - Bithumb - Bitstamp - Bittrex - Bit-Z - Coinbase - Coinnest - Coinone - Cryptopia - Gate.io - GDAX - GOPAX - HADAX - HitBTC - Huobi - IDEX - Koinex - Kucoin - Kraken - LBank - OKEx - Upbit ** More exchanges coming soon ** Cryptocurrency Market Data: - Price - 24h Volume on each Exchange - % Price Change: 1 hour, 1 day, 7 days TRENDING COINS We make finding popular coins even easier. View sorted lists of the top trending coins ranked by % price change (1 hour, 1 day or 7 days). Get real-time access and learn more about each project. TRENDING ICOs The Trending ICO tab gives users exclusive insight into the most anticipated ICOs. 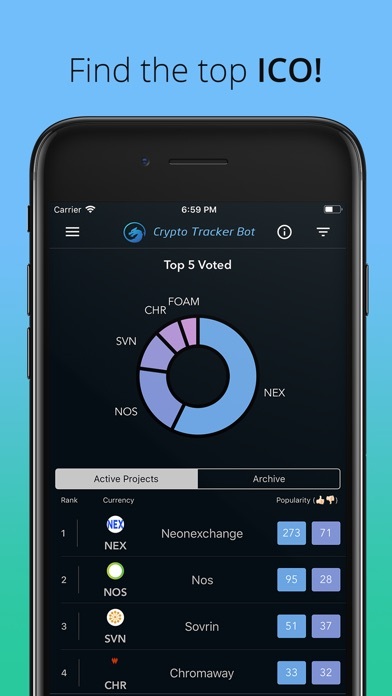 - Vote for your favorite projects - View detailed token metrics - Learn more about top projects ____________ ABOUT US The Crypto Tracker Bot founding members are based in Los Angeles and consist of your average engineers (driven by memes and reddit) looking to help anyone getting into cryptocurrencies. We strive to deliver valuable services for all our users. Get in Touch. 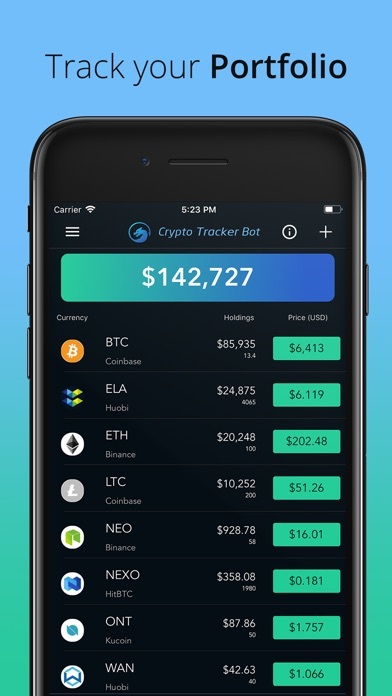 support@cryptotrackerbot.com Or visit our website: https://cryptotrackerbot.com We’d love to hear from you! Enjoy. 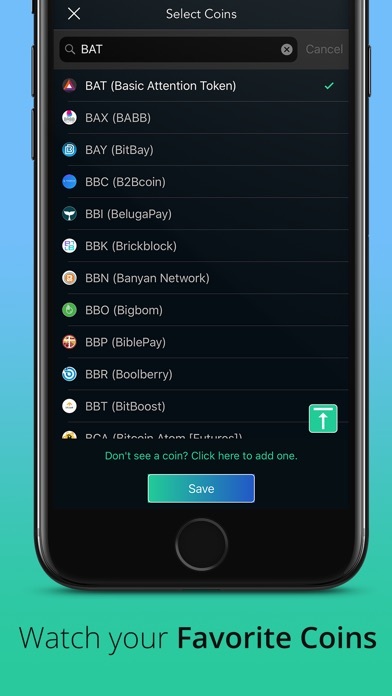 This is a fantastic app guys , made me lots of money and saved me lots of time , now I don’t need to scroll over exchanges looking for new coins. You guys rock! I’ve introduced it to all my chats .